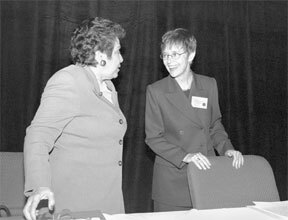 Chopp leaving to head Yale Divinity School: Provost Rebecca Chopp, shown here with former Health and Human Services Secretary Donna Shalala, says the opportunity to make an impact on the next century of theological education was too great for her to turn down. So, after four years as Emorys provost, Chopp will leave this summer to become the 13th and first female dean of Yale Divinity School. Click here or above for the full story and click here for a list of Chopp's achievements while at Emory. Photo by Jon Rou. Briefs: CCTMA to subsidize bicycling class; NPR correspondent to give lecture; Carter heads election reform hearing. Med student Parikh has eye-opening research year: Chirag Parikh took a year off from medical school to study with Henry Edelhauser of the Emory Eye Center. He received a $12,000 grant from the Research to Prevent Blindness (RPB) foundation. Click here or above for the full story. Special photo.